The minimum order is € 10,00 (not included shipping costs and VAT). The shipping costs are calculated according to destination, weight and amount of the order. The estimated shipping cost of products in the cart can be seen before proceeding with the order, using the panel in the cart. The goods are sent to the customer with free packaging, and the parcel contains the Invoice if the purchase has been done by a company or a Packing List in case of private customers. Before shipment, even a private can ask for an invoice but in this case we require his birth date (according to EU laws for billing to foreign private customers). The parcel is delivered at home by a courier. In case of absence at the moment of delivery, a notice/email should be left by the courier with the instructions about another delivery attempt or the pick up at their deposit. We suggest to contact our Customer Care at sales@vernicispray.com for any problems or delay in delivery. The price of each item are always not included VAT. The VAT is not applied to the the purchases from not Italian companies with valid VAT NUMBER (it must be valid for VIES - VAT Information Exchange System). In case of changes in the VAT rate or in other indirect taxes occurred after the print of catalogues, the proportionate variations in prices will be applied. The transport charges are also subjected to ordinary VAT. The customer can exercise the right to withdrawal, shipping back the purchased items at his own expense within 30 days from the date of receipt, in intact package. Shipping costs are not refundable. We apply the guarantee P&B "Satisfied or Refunded" on all products except for custom items based on customer demand, for which there is no right to withdrawal. (D.Lgs 206/05). Promotions, discounts and complimentaries indicated in the catalogue or on the site are part of the proposals and Sale Conditions. Any complimentary always remain to the customer even if he decides to exercise the right to withdrawal. The purchase orders are cancelable only before invoice issue or parcel departure: the shipment takes place immediately in the hours following the order (up to 24 H) so if you want to cancel your order you must do it as soon as possible. Instead, purchases of our custom paints are never cancelable. Bank Transfer. 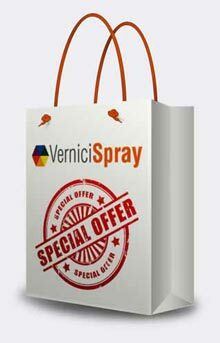 Once you made the transfer, we recommend to go into your order details page and write the CRO or send us the receipt of payment by email to sales@vernicispray.com. In this way we can know quickly that the payment has been made and proceed your order. Mi complimento per la rara professionalità dimostrata, maggiormente tenuto conto che avevo effettuato un ordine esiguo. Ho ricevuto le schede di sicurezza come richiesto in tempi brevi e con una mail molto cortese. Posso loro ringraziare invitandovi a continuare a lavorare in tale modo "serio". Saluti. Andrea P.